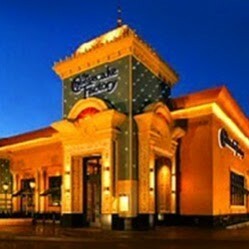 The The Cheesecake Factory is a restaurant inside Maryland Live! Casino in Hanover, Maryland. Convenient location, great food. Had soup and sandwich combination, it was great also came with salad. Enough for a few days if you are not a big eater. Worth the money. Beautiful building. Good food. Friendly service. I have been here 3 times and every time our staff was very knowledgeable. When a friend of mine ordered a drink that was not on the menu, the waiter checked with the bartender and was able to provide the request. The cheesecake is absolutely delicious. All in all a great experience every time. Nice place for a date, or a family snack. Prices start at $ 7.98 a slice and up. If you are hungry when you come here you will leave that way. I like real cheese cake. This is cutsie cheesecake . Whipped and light is not filling. Only made me hungry. But, on the whole taste good and atmosphere is nice. Large free parking area with handicap parking and entrance with handicap bathroom and stalls. Wheelchair accessible. Easy access to parking. I come here once every 4 to 6 months . waiting to be seated usually takes 15 to 20 minutes during the week busy or slow weekends feels quicker maybe because there is more staff. Service has always been good for us .staff has been friendly and knowledgeable of menu . food always prepared to my liking and i usually will buy an extra meal to take home for my lunch the next day.i enjoy my visits at this Cheesecake over others i have been to . my only suggestion is wait staff should always say hello to customers as they go buy them and back up there fellow servers ,one day that customer will return and remember them . Absolutely amazing service. Atmosphere was warm and inviting. Our waiter Long (yes we double checked and asked him how to spell his name) went above and beyond making our entire dinner experience incredibly worthwhile. He was considerate and polite and quite humorous. Should you ever choose to go to this particular Cheesecake Factory, ask for Long, if possible. And his food suggestions were top notch. Just ask what he would recommend if you have certain tastes. Also, it’s right by the casino, so you can choose to play before or after you eat here. The next time we’re in town, we’ll definitely be coming here again. Ill start with the good. The food was surprisingly good. Was shocked when it finally came out of the kitchen. Which leads into the bad... It took forever for us to get it. The place was empty at the time. Our server took our order and 10 minutes later had to come back and ask for what my wife had ordered again. He hadn't even put it in the system yet. The service here is TERRIBLE. I watched as our server helped another table several times before coming back to us which was very scarce to begin with. I ended up having to grab a passing staff member for help with getting our check and actually paying it. The only plus was that he was very polite. The booth we sat down at was smelly and the table was very sticky. I wiped it down myself with some wet wipes we had but didn't seem to change anything. I hope they do something about the staff here they have really good food. Reading other reviews it seems to be a trend here unfortunately. I went with a group of friends during lunch time. There was no crowd which I loved. We asked to be seated outside and was seated within 3 minutes. The waitress was quick in getting us everything we needed. The food was good. I didn’t enjoy the Caesar salad. I have had better but the everything pizza and white macadamia nit cheesecake was great. This particular location is no better or worse in terms of the food (taste and quality). This is a restaurant chain, after all. So, no complaints there. The only issue I’ve had with this location is the to-go process as it relates to orders placed ahead (online or by phone). They don’t have a dedicated employee to assist customers who ordered ahead and are just there to pick-up. They offer online ordering, but then counteract this by requiring you to stand in the general to-go line when you arrive to pick up. This line is the same line as people who are ordering cheesecake to-go. So, it’s always very crowded. Defeats the purpose of me ordering and paying in advance if I have to wait for 7-8 people/families to order (15 minutes) before I can just pick my food up and leave. We went in right before 5pm and only waited a few minutes with a party of 4 adults and 2 kids. The food was great and the service was excellent! Our server was extra sweet with the little ones we had with us, actually talking to them instead of only their mom. When they ordered ice cream at the end, they were excited to see it come out with whipped cream and a cherry on top!! The adults enjoyed the cheesecake we took to go!